Shrink wrapping has many names. Although shrink wrapping accurately describes the process of applying heat to shrink film around product, there are three distinctly different shrink wrapping processes-- bundle wrapping, shrink wrapping, and shrink sleeving. Bundle Wrapping or sometimes called tray bundle wrapping typically uses a polyethylene film when toughness and puncture resistance are important. Bundle wrapping does not 100% enclose the product. The bundle wrapping process covers the top and bottom of the package, but the sides are open. When heat is applied, the film tightly shrinks against the product, but an opening is left on either side; these are often referred to as bull’s-eye holes. The polyethylene film is considerably less expensive, but it lacks clarity. Shrink Wrapping, sometimes call overwrapping, typically uses a Polyolefin film. The film completely encloses the product. The film provides high clarity and is used when appearance is important. 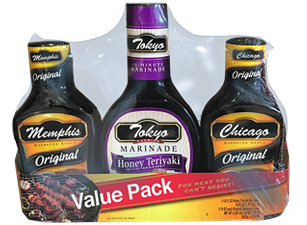 Shrink wrapping is commonly used to create multi-packs and on-packs while maintaining product visibility. The polyolefin is typically of a much lighter gauge when compared to PE films, but more expensive. That said, the increased material price is usually offset by the higher run speeds of the equipment. Shrink Sleeving, is the process of applying a sleeve around a product or container. Shrink sleeves deliver high-impact and colorful graphics that fully wrap the product, providing 360 degree graphic coverage. Common shrink sleeve materials include PVC and PETG. They can be applied to symmetrical and non-symmetrical containers, but testing is required to ensure shrink uniformity. We have the capability to support all types of shrink wrapping and applications. Contact one of our packaging experts to see which process is the best for your application.